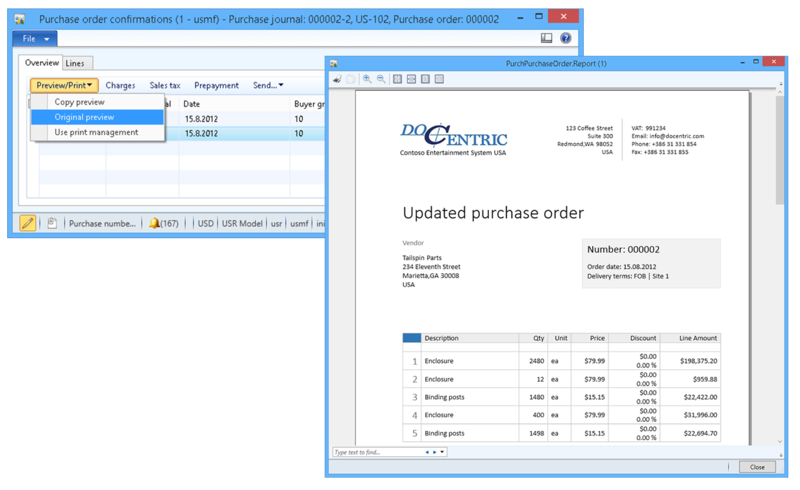 Costly development, painful updating, design limitations such as printing two-sided invoices, performance and deployment issues, no true WYSIWYG designer – these are some of common SSRS shortfalls addressed by Docentric AX. 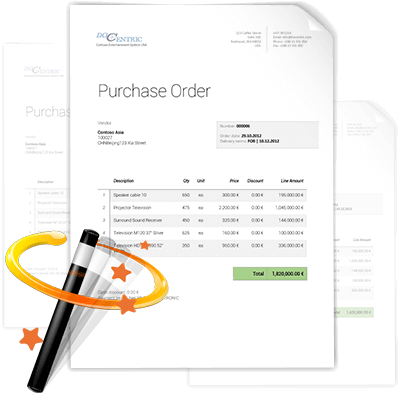 You can transform your existing SSRS reports into professional looking purchase orders, invoices, agreements, HR documents, etc. 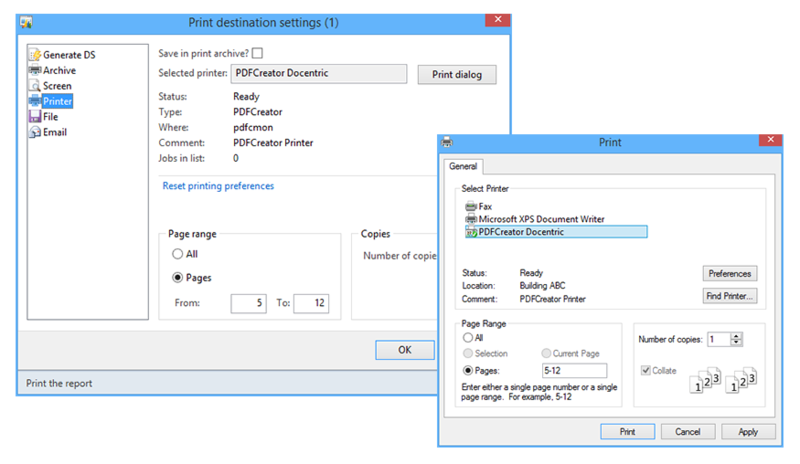 in Microsoft Word and also print them as Word documents. 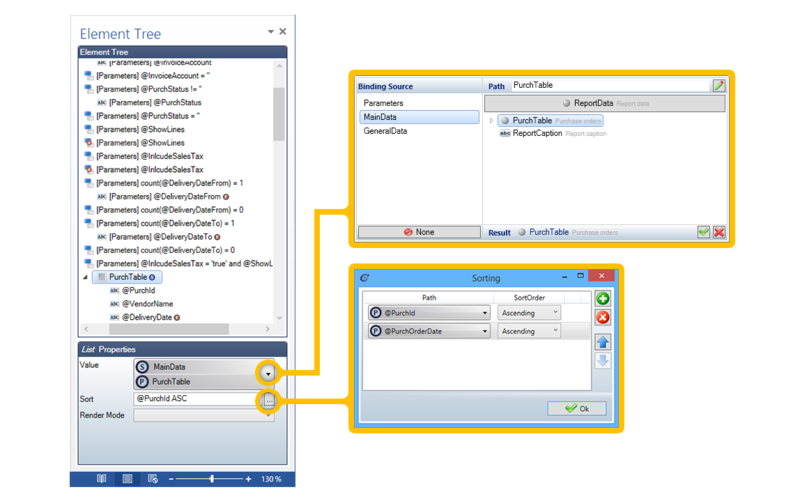 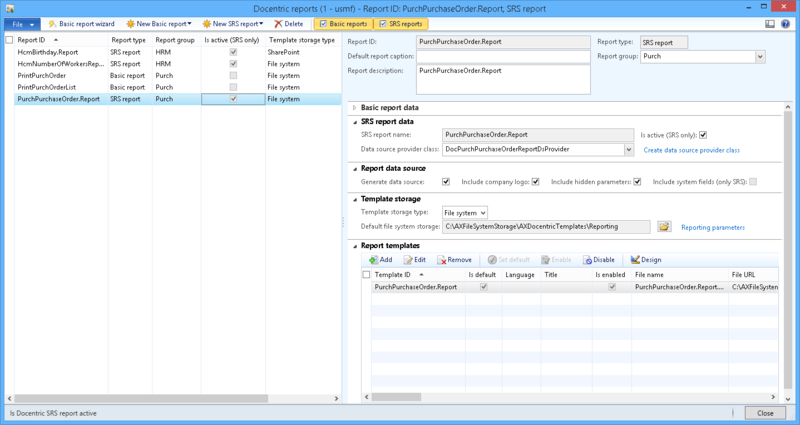 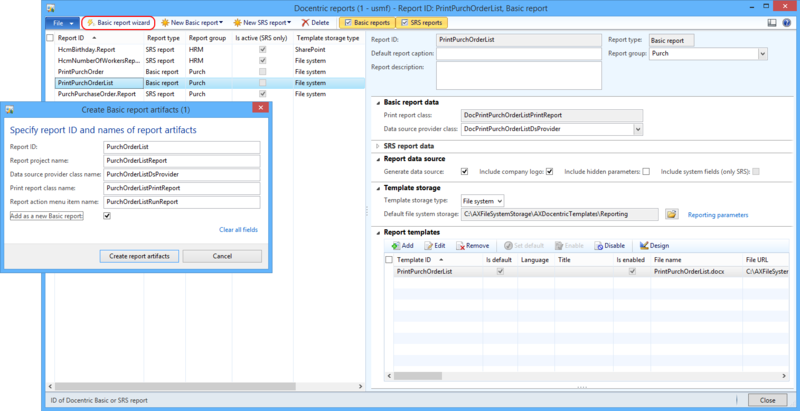 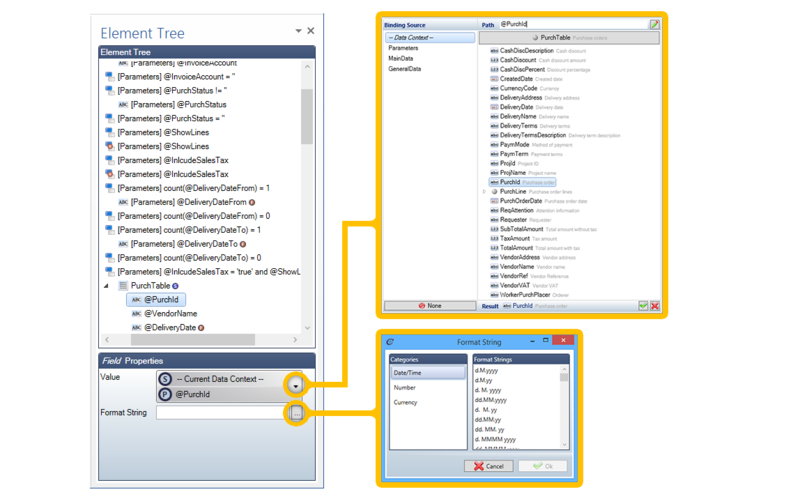 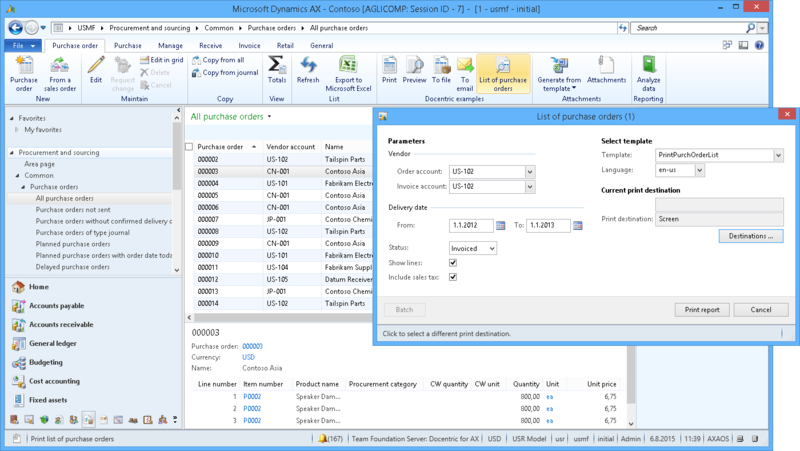 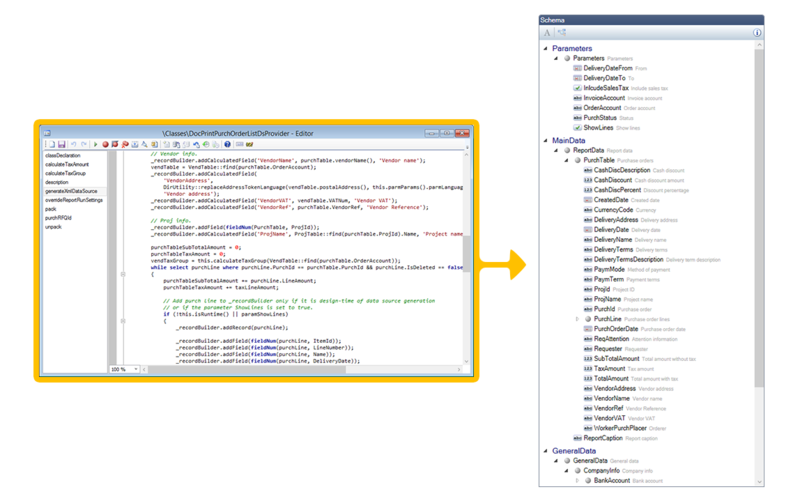 No coding is required to improve an SSRS report design with Docentric AX. 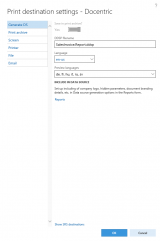 Even end users can finally be engaged in report customization. 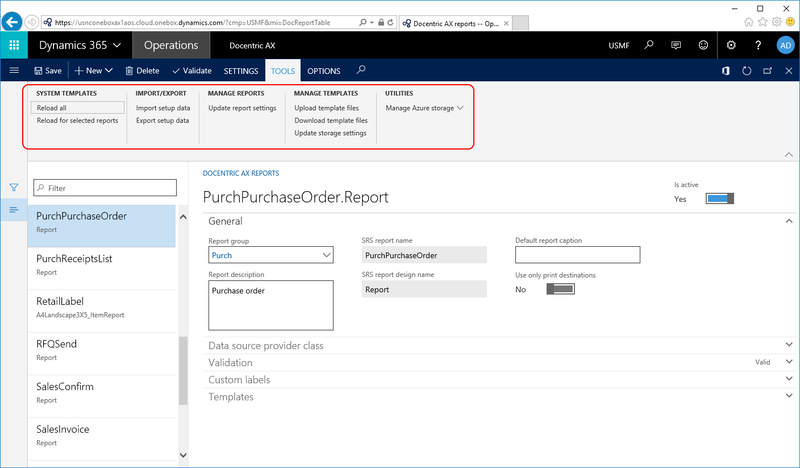 If you want to add some additional data to a report, you can do it without changing the report’s temporary tables or queries. 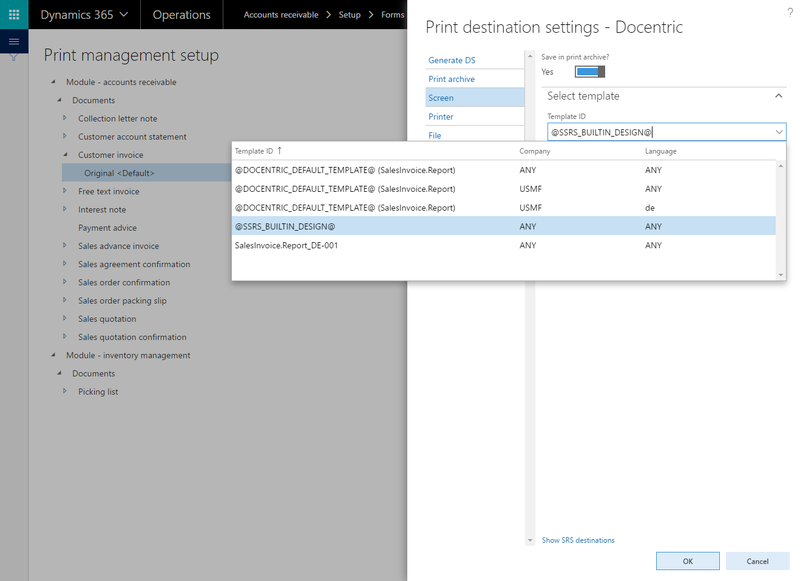 No report deployment or AOS restart is needed to see the effect of data or design changes. 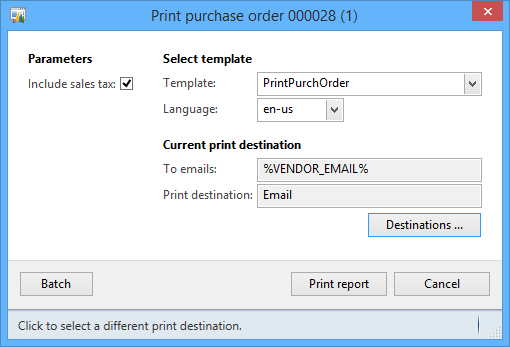 Print destinations are improved with some really cool features. 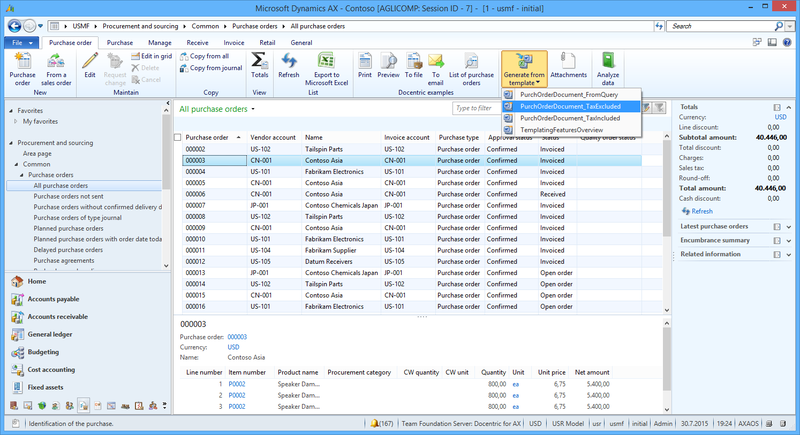 Docentric’s enhancement of SSRS reports runs side by side with a built-in SSRS framework and is simple to use. 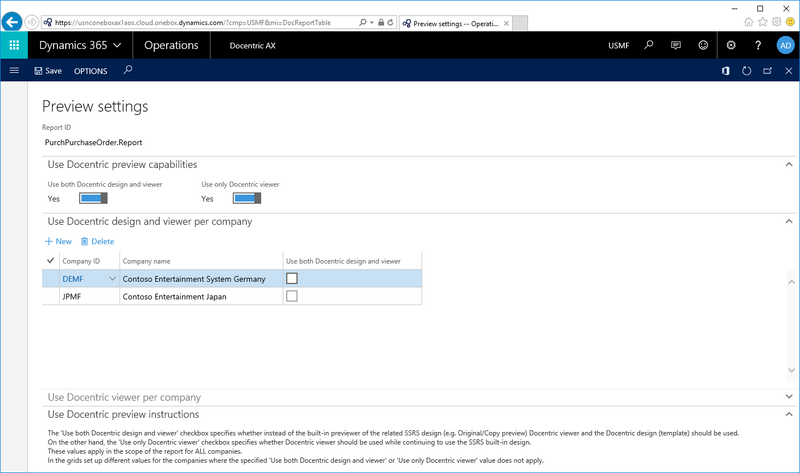 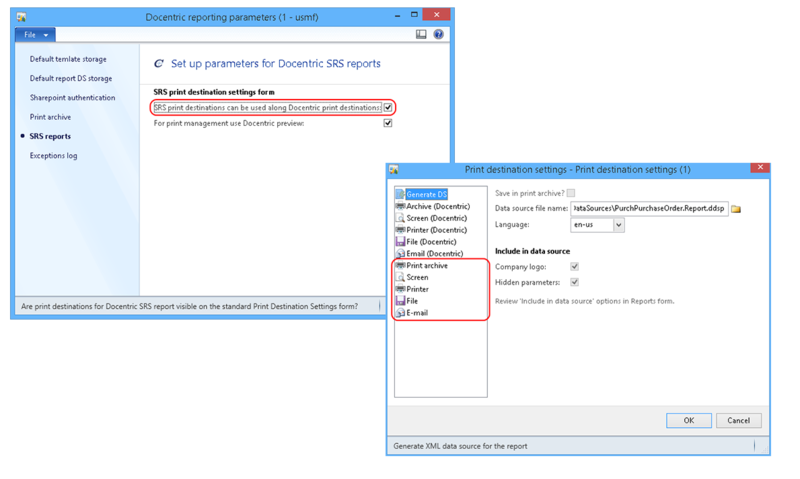 To activate Docentric AX with a particular SSRS report, just mark it as such. 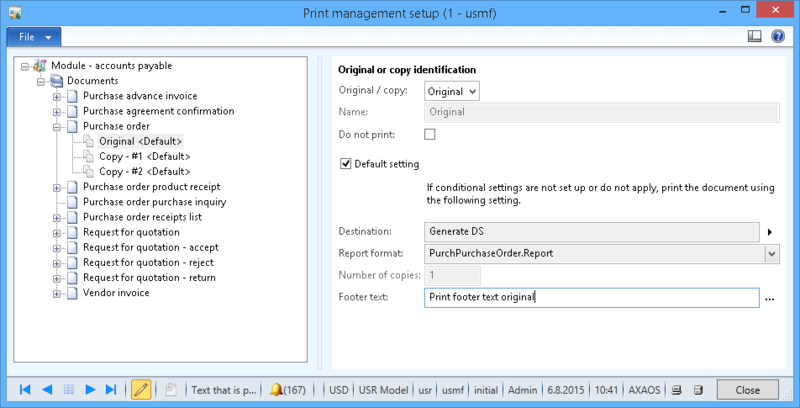 You can turn the functionality on or off with a button click. 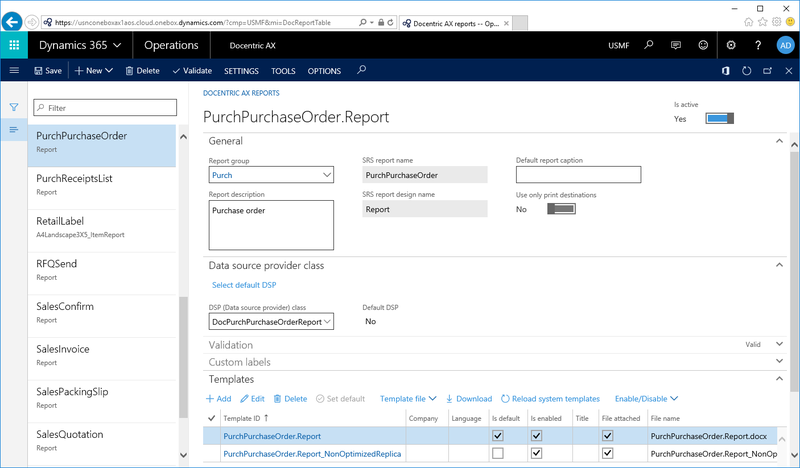 We created a completely new lightweight reporting stack in Dynamics AX 2012 called “Basic reports”, which will drastically reduce your report development time. 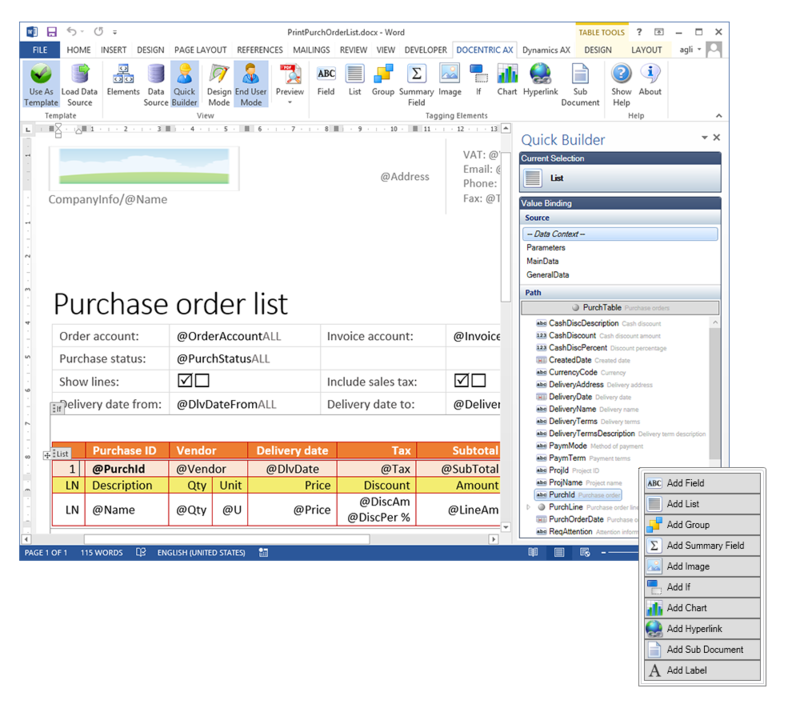 Preparing the data for a report has never been easier: forget about creating those temporary tables, tedious queries or views. 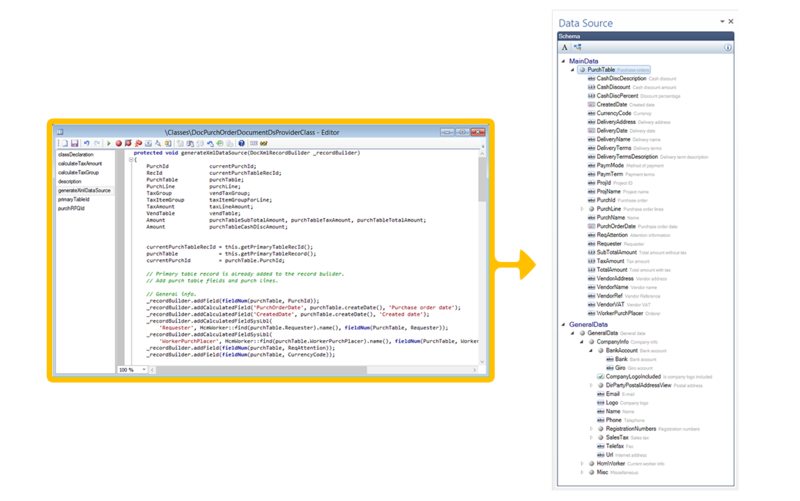 Simply traverse through the needed data in X++ and shape/nest/calculate them as you like using Docentric AX powerful APIs. 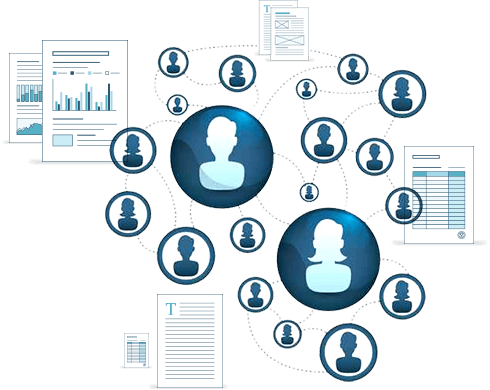 Focus completely on report data, not on infrastructural plumbing. You don’t have to worry if you forget to add a report parameter, a field or even a child table. 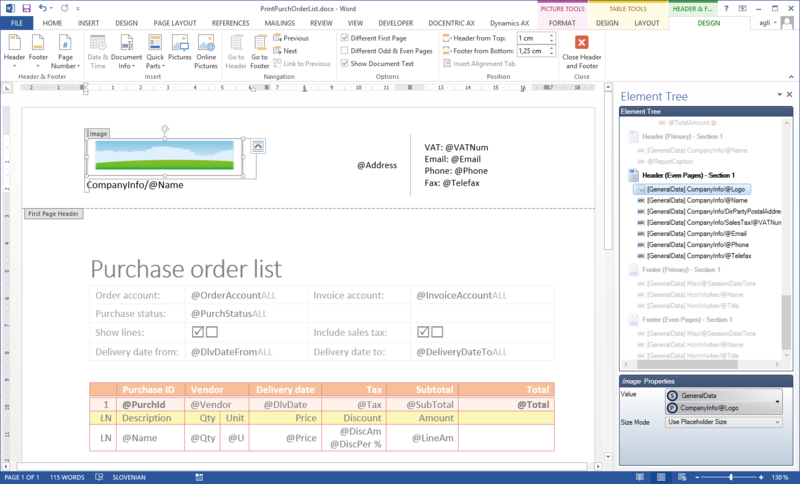 You will add, use and test them on your report in no time. 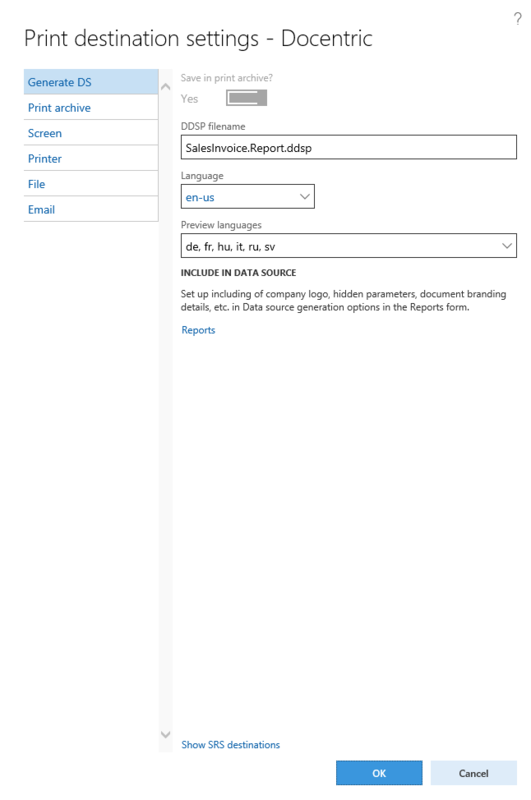 For each new report a smart wizard generates report artifacts for you. 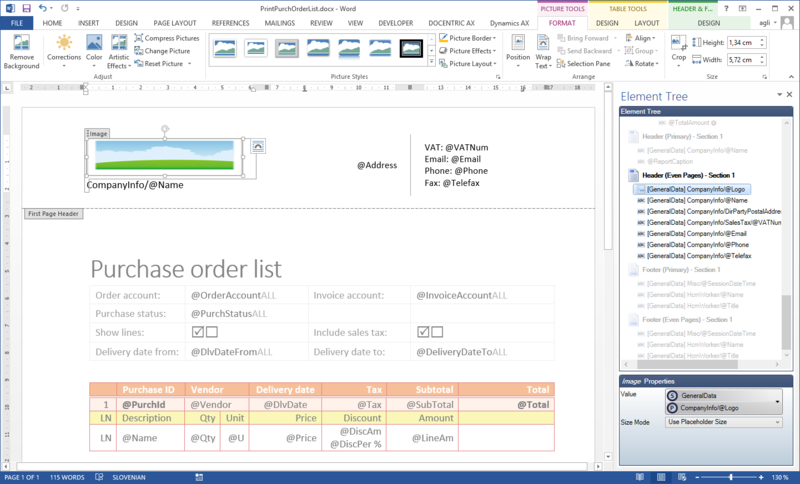 Your only task is to provide report data in X++. 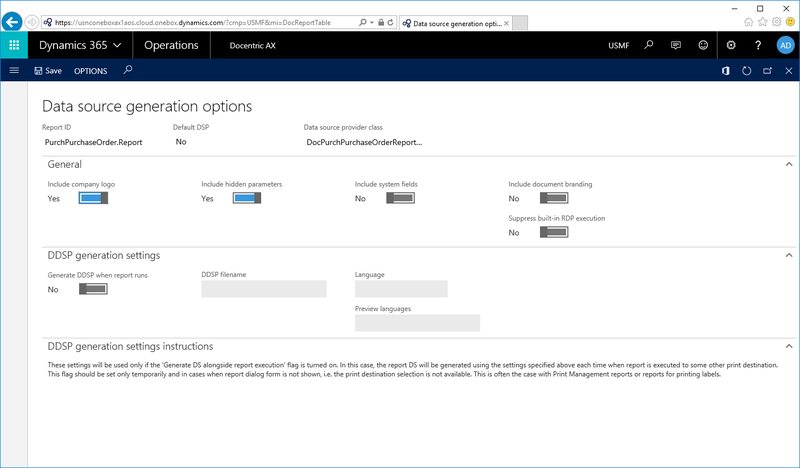 Still, you may have complete control over report execution by injecting your custom business logic at various execution points. 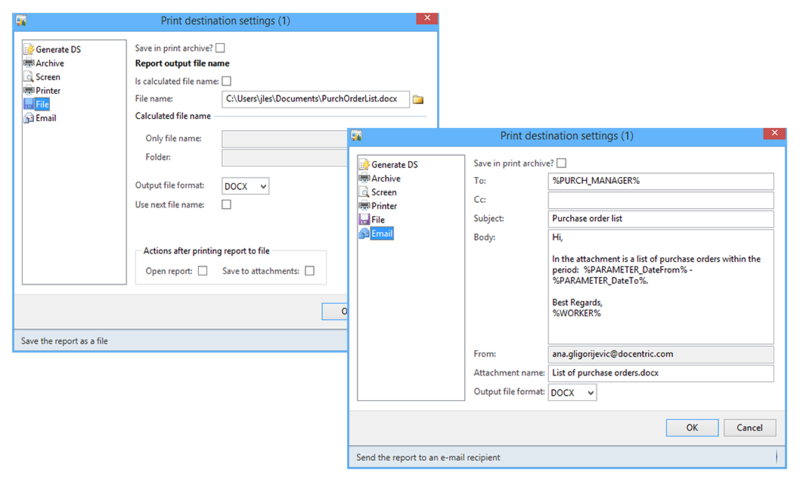 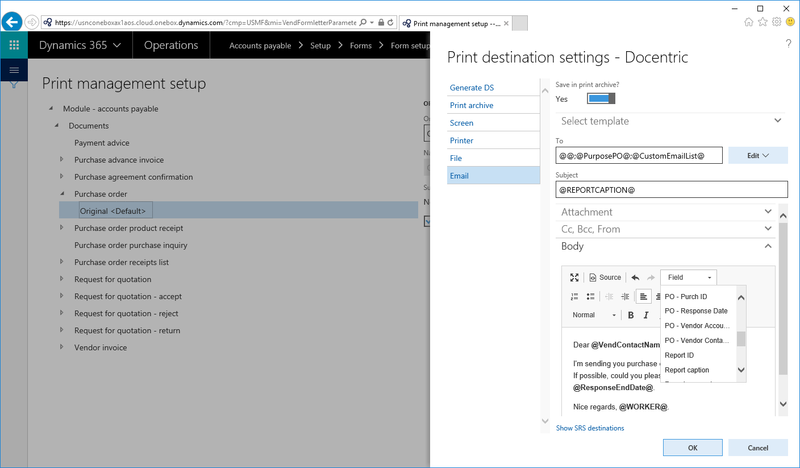 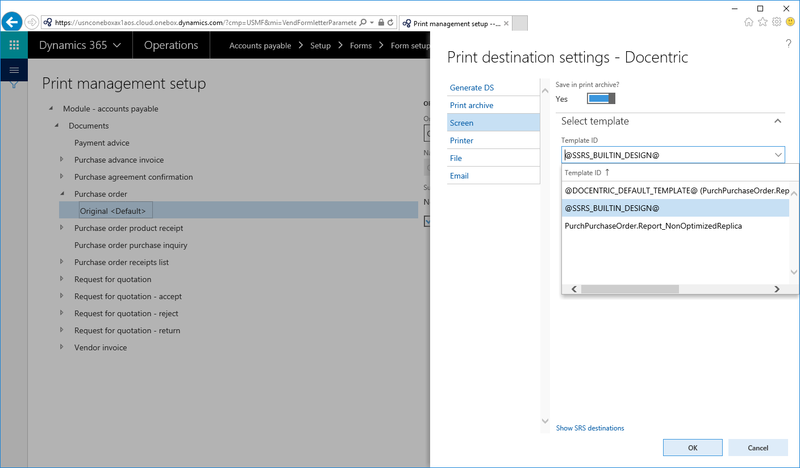 You can send a report to multiple enhanced print destinations. 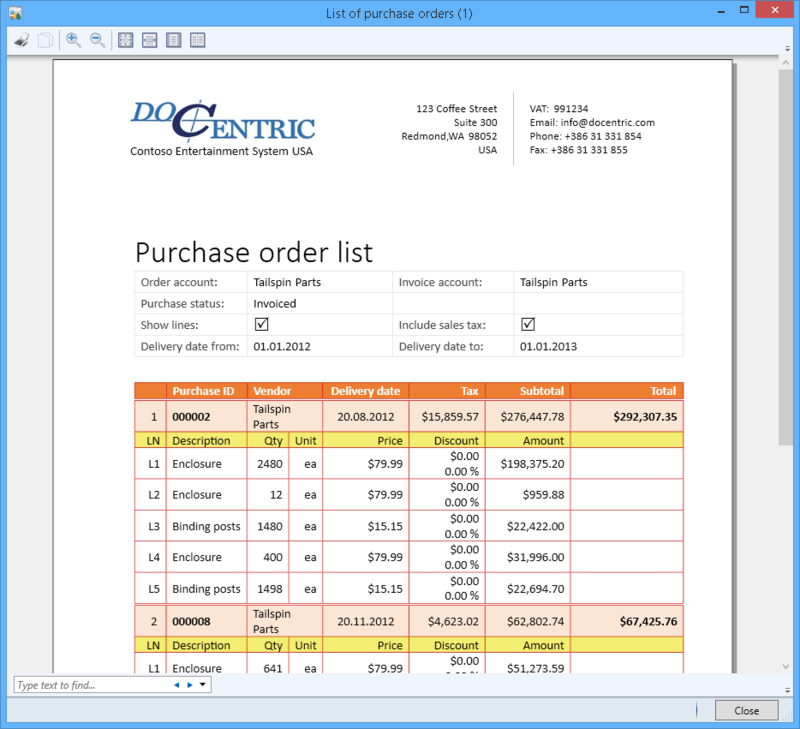 With Docentric AX all reports can also be printed as Word documents. 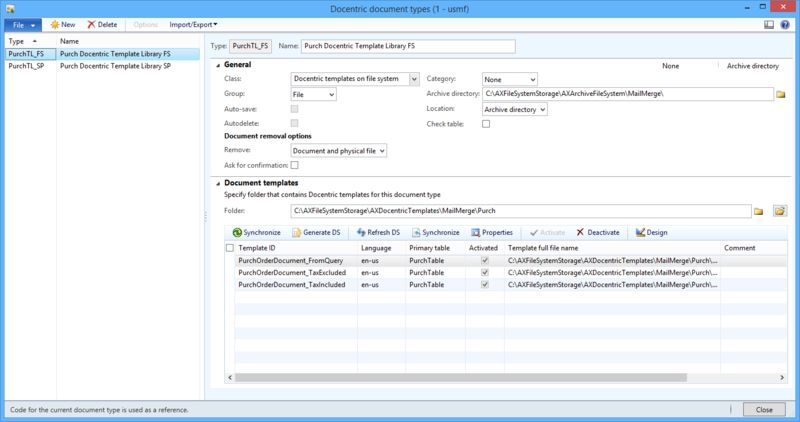 Are you troubled with Template Libraries within Document Management Framework and MS Word Add-In? 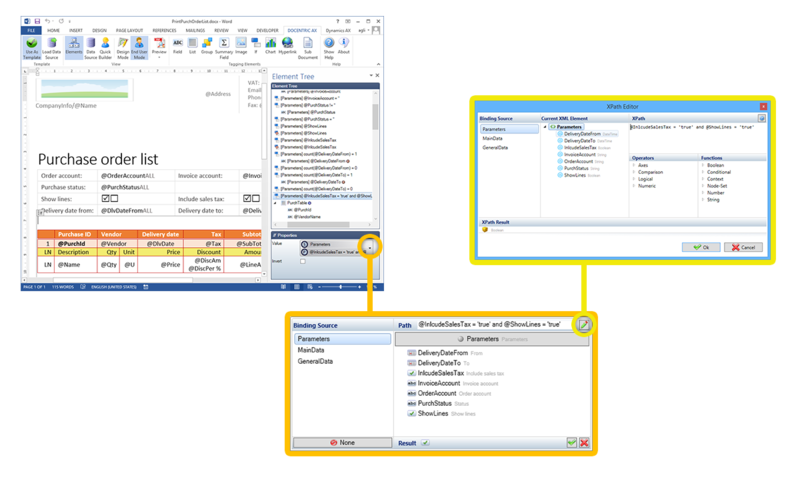 With Docentric AX you can experience a much more comfortable way of designing and maintaining your Word templates. 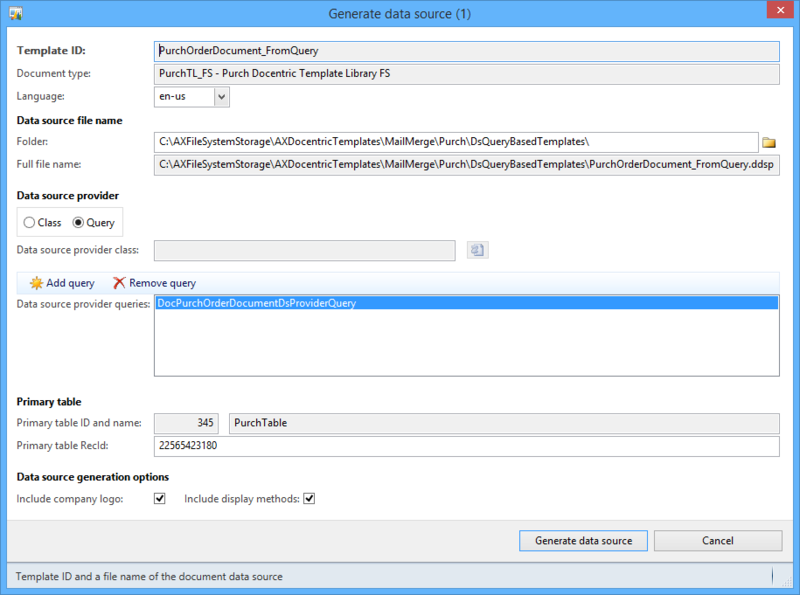 Besides queries, you can use X++ to gather data in the context of the Primary Table record and shape/nest/calculate them according to your needs. 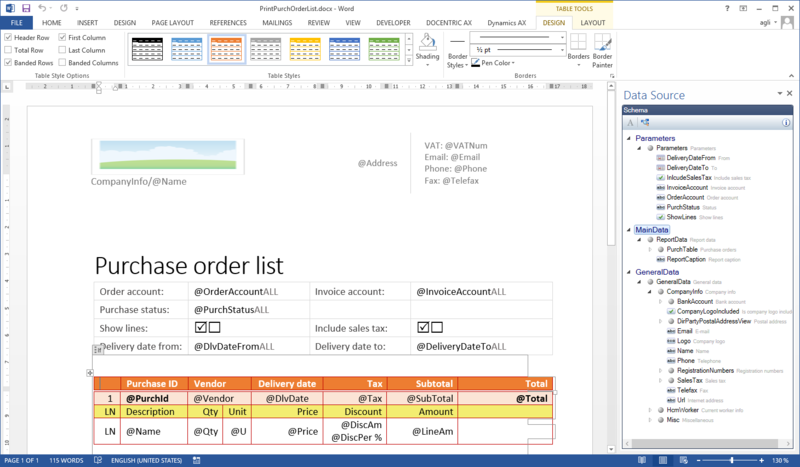 No temporary tables are required. 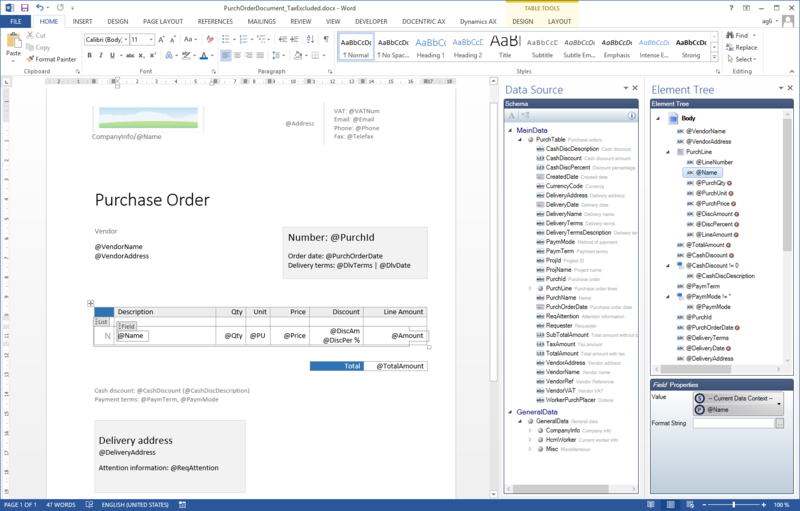 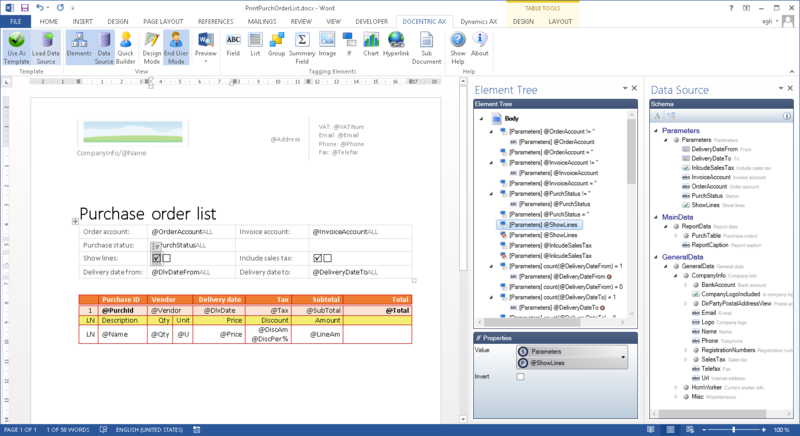 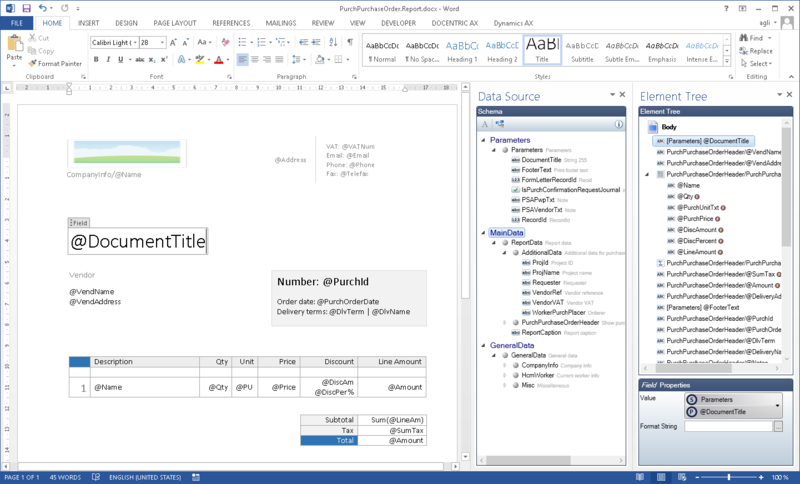 No display table methods, no complicated queries – this time, you are in charge. 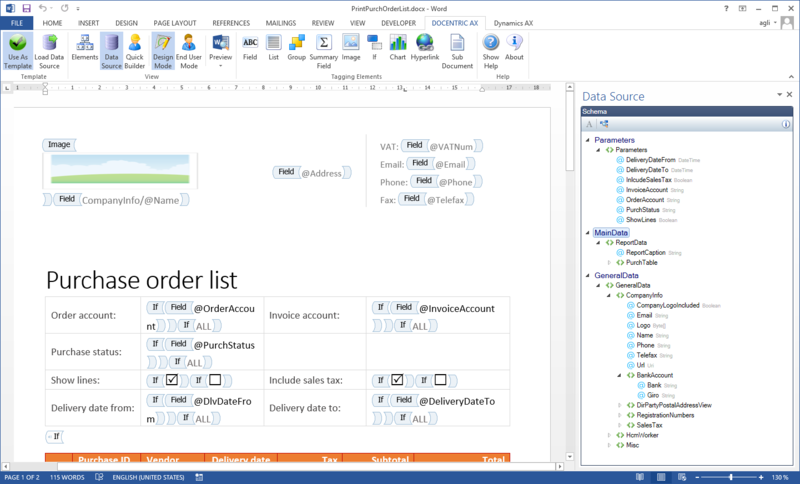 Just update the data source in X++/query and refresh it in Docentric AX designer, which is actually MS Word with a special Add-In. 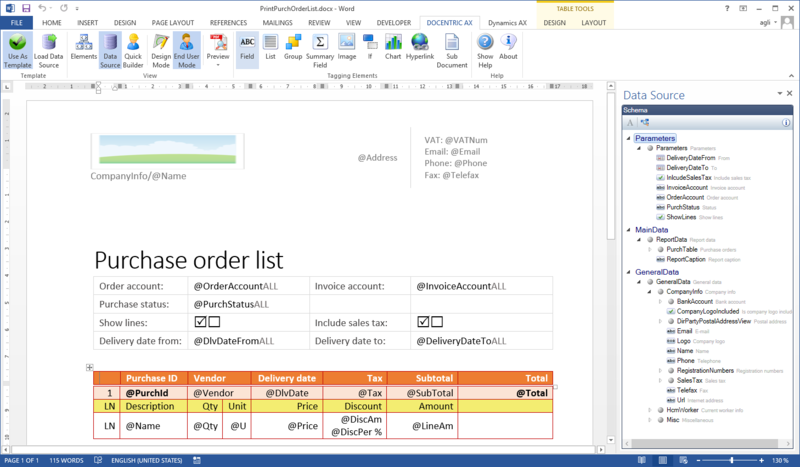 Everything works as expected. 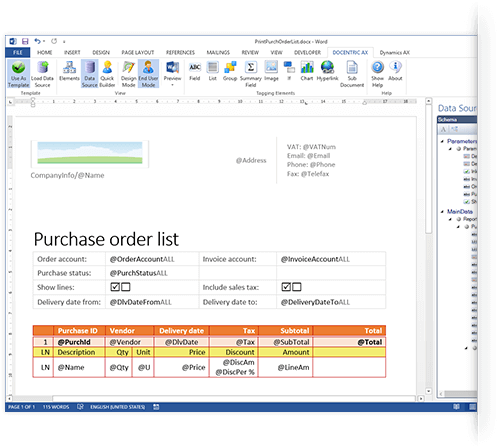 Repeating blocks, nested tables, bulleted lists, images and shapes bound to your data sources, realistic preview and much more is at your disposal. 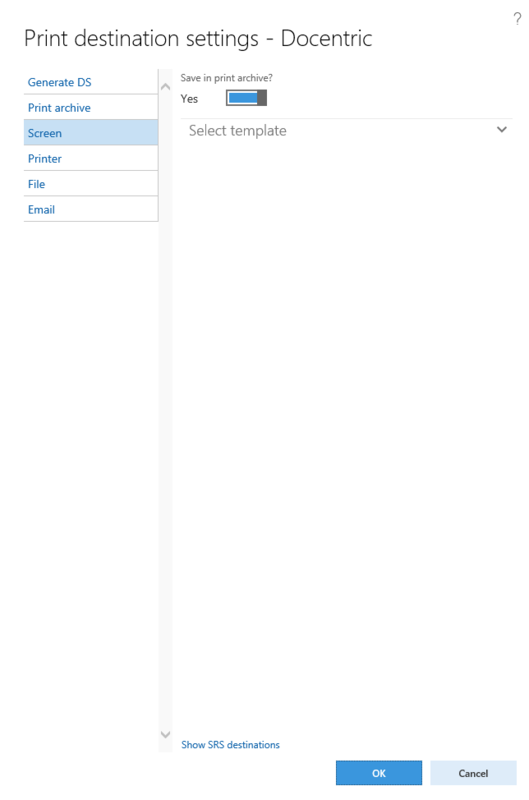 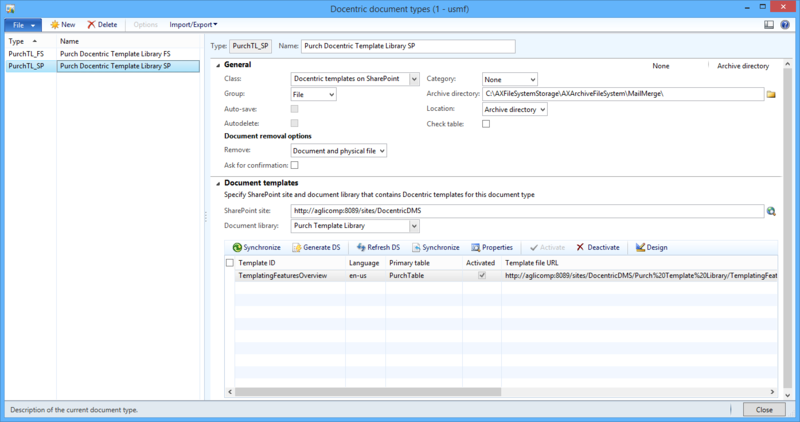 You will be surprised how infinitely better a Document Template Libraries solution can be. 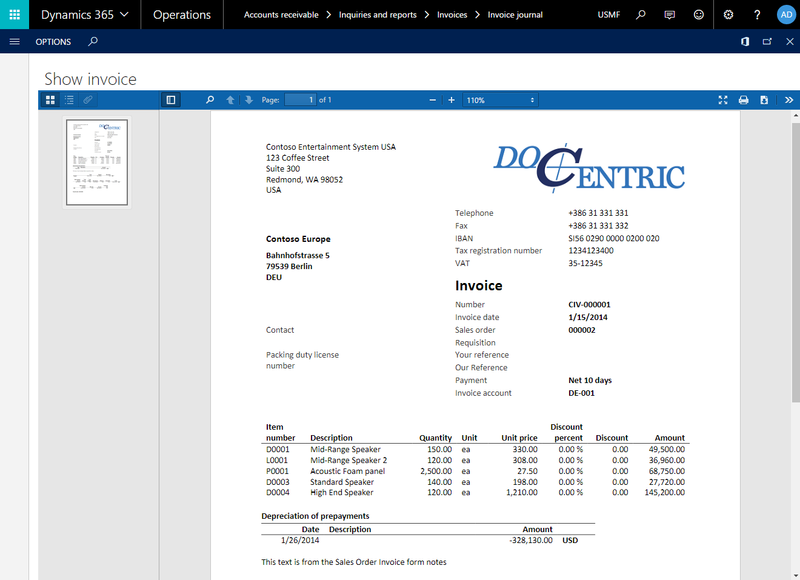 No matter if you enhance built-in SSRS reports or Word templates, in AX 2012 or Dynamics 365 for Operations, you will design your reports and documents with the same Docentric AX Designer. 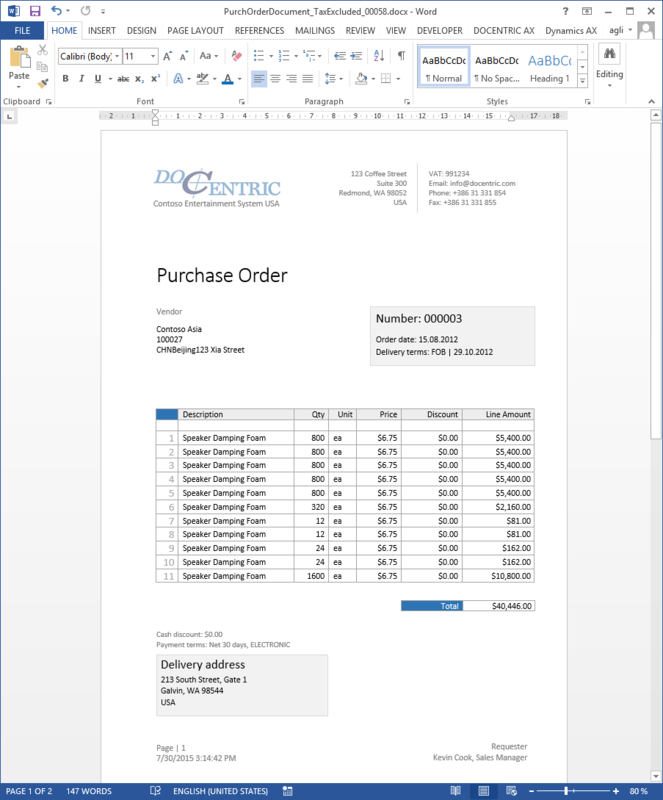 MS Word with an addition of Docentric AX Add-In lets you design your templates in Word just like any other document, using all Word’s awesome features. 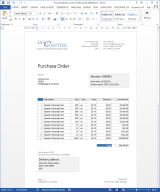 Using Word, you can easily achieve a unified professional look of your business reports and documents companywide. 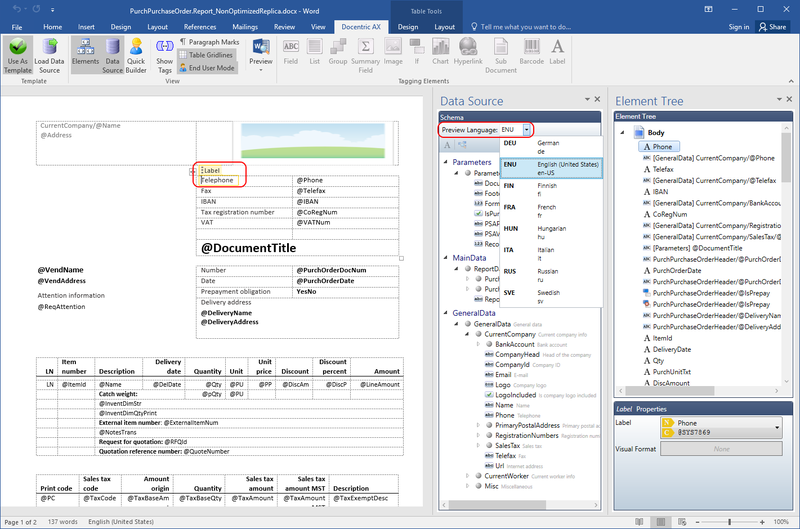 Our special Add-In for Word helps you mark a template with placeholders and bind them against the attached data source. 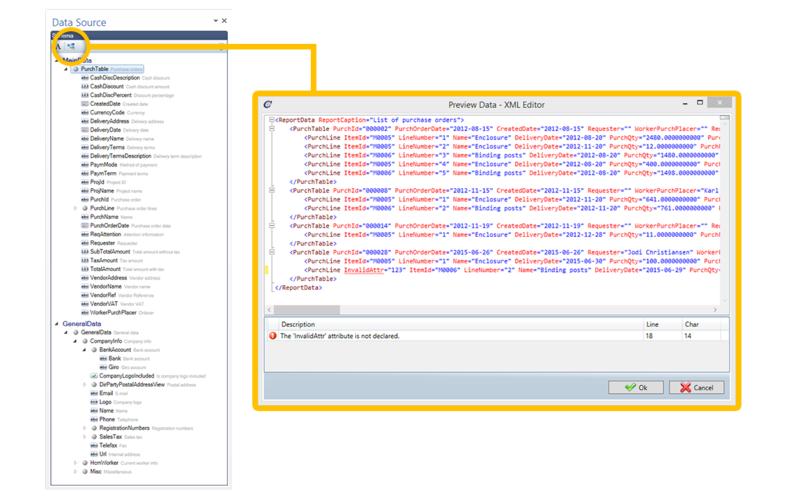 You can conditionally include/exclude document parts, use XPath to write formulas, filter and shape data, or dynamically insert subdocuments. 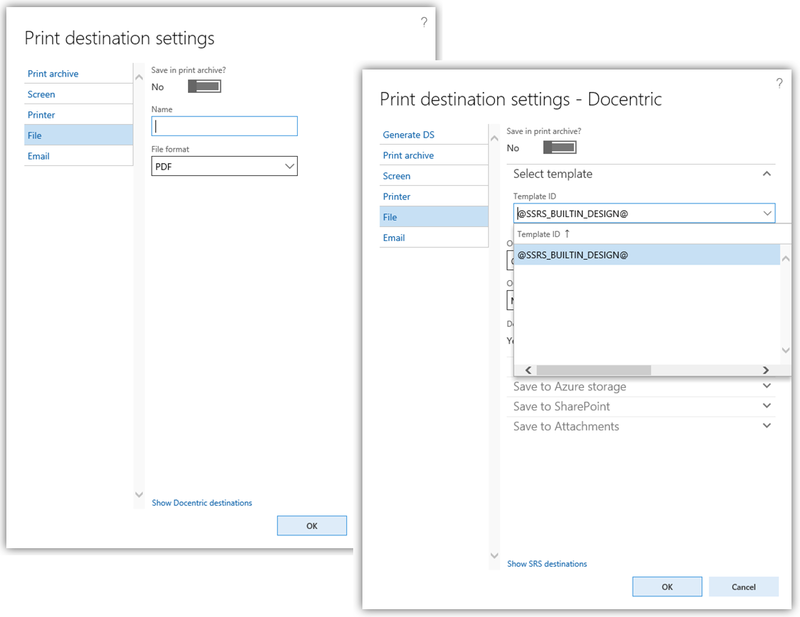 While designing a template you can use a realistic offline document preview in different languages. Template design can be handed over to your AX consultants or advanced end-users. 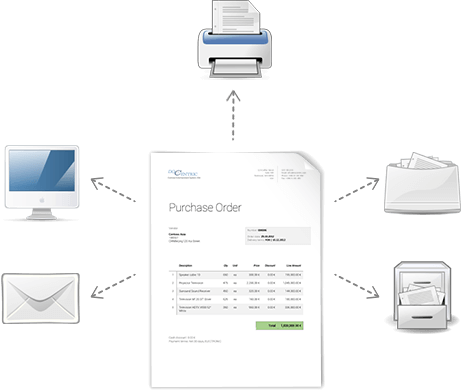 Simplify the automation of purchase orders, invoices, agreements, contracts, HR documents, forms, claims, legal documents, insurance policies, checks, letters, notes, statements, bills, product datasheets, certificates and all those documents that can be truly and only edited with MS Word. 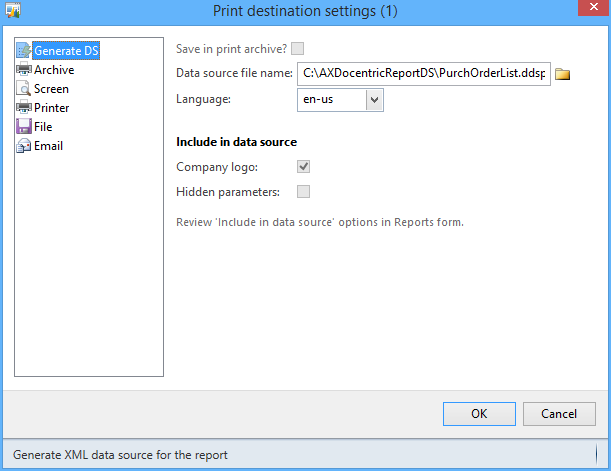 You can print report to a dynamically named file (e.g. 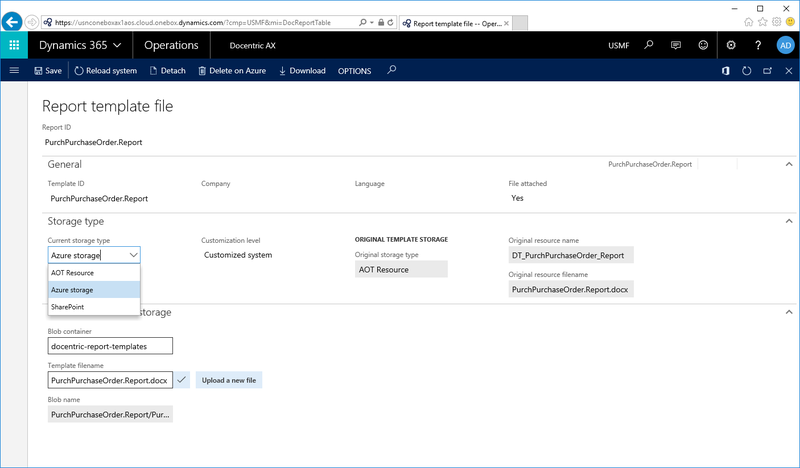 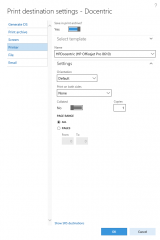 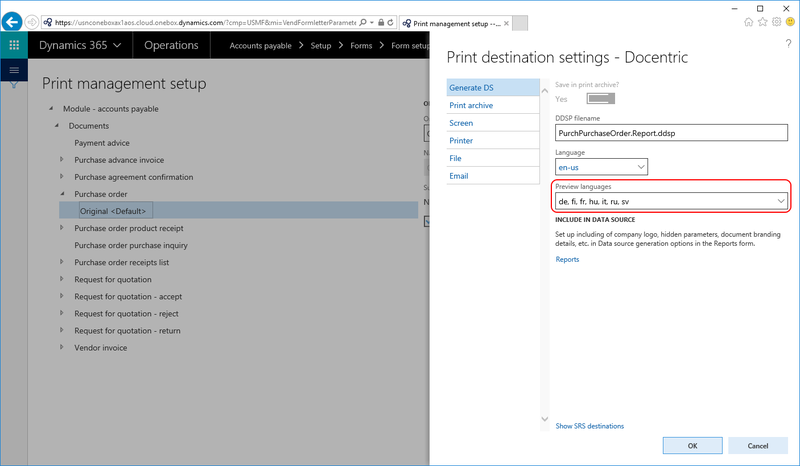 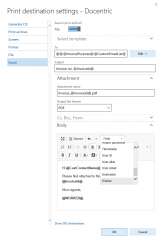 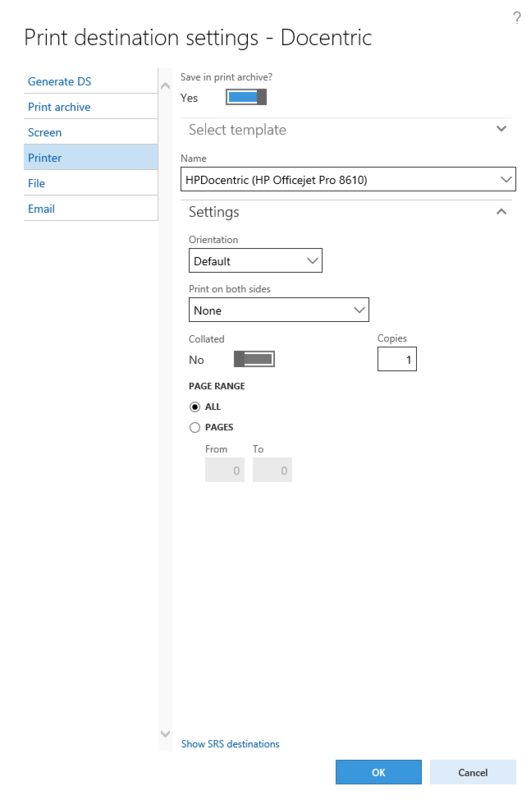 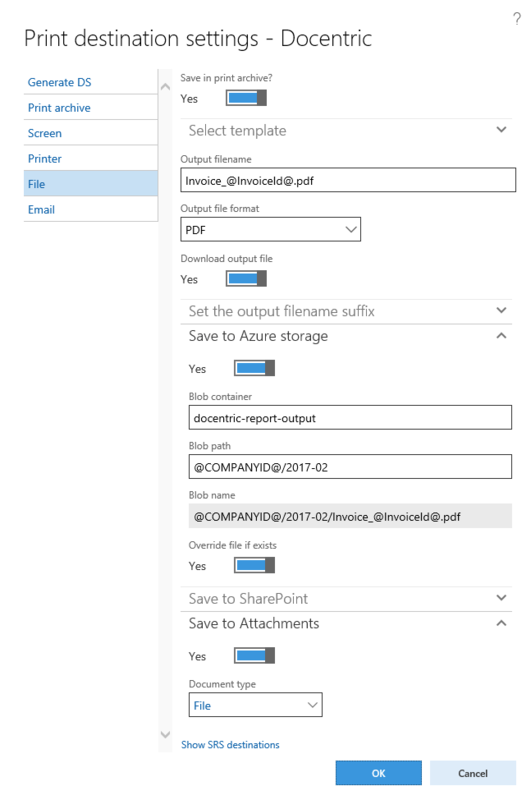 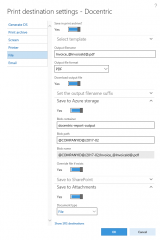 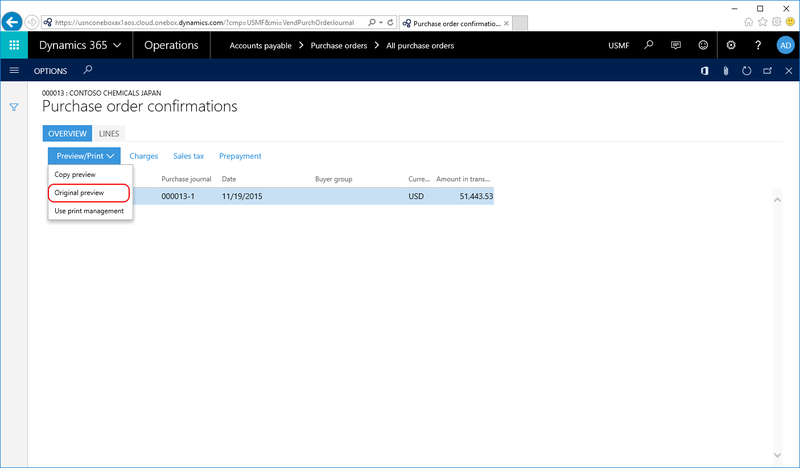 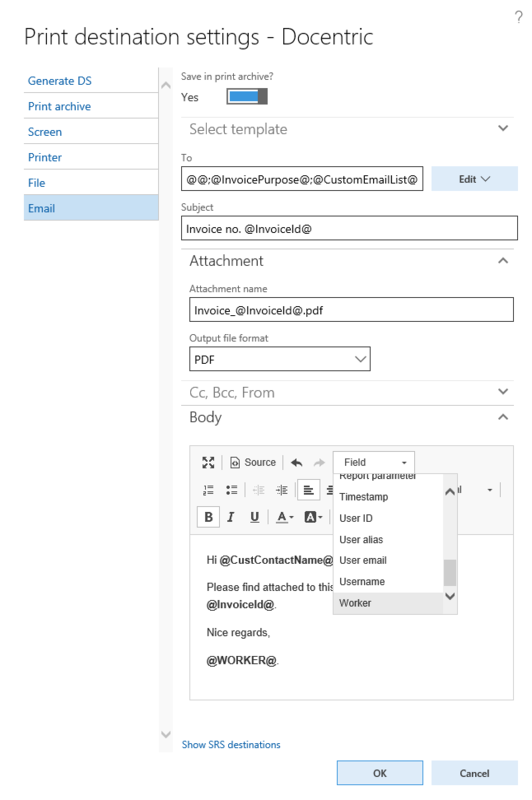 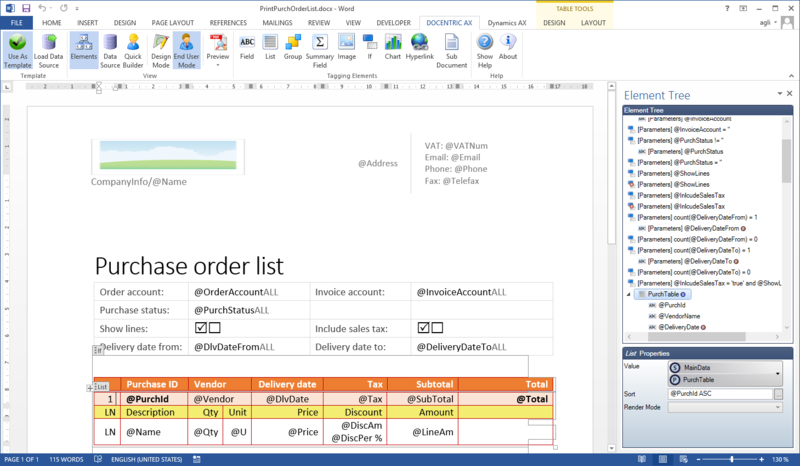 Invoice_<InvoiceId>.pdf), save it to Attachments, SharePoint or Azure storage. 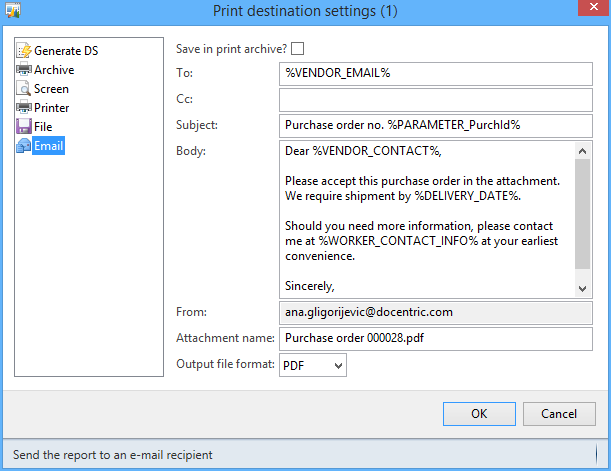 You can send more than one report/attachment in a single email, or use placeholders in print destination settings such as email body, subject, email address list, output filename, etc. 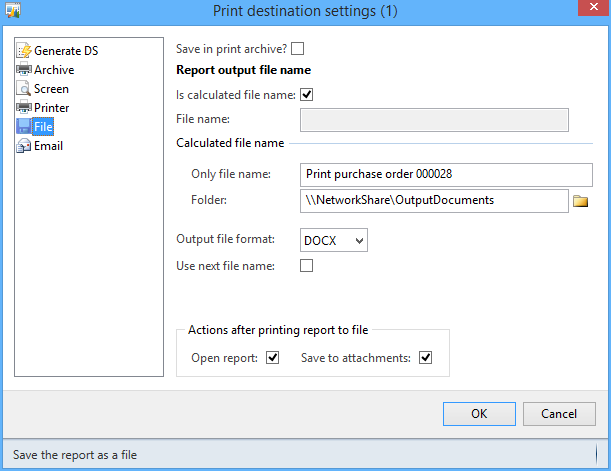 You can use original SSRS report designs with improved Docentric print destinations, and all that for free. 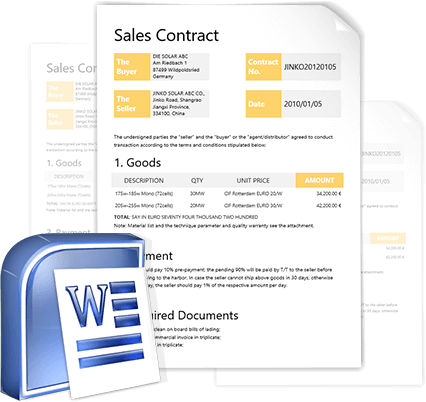 You can now also print your reports as Word documents, which allows you to manually edit already generated contracts or quotes. 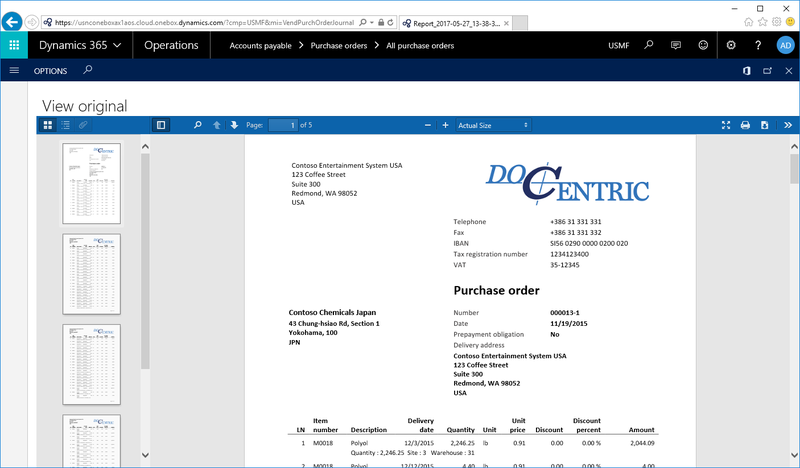 Empower your end users with the right tool, familiar Microsoft Word, and they will be happy to take part in report and document customization. 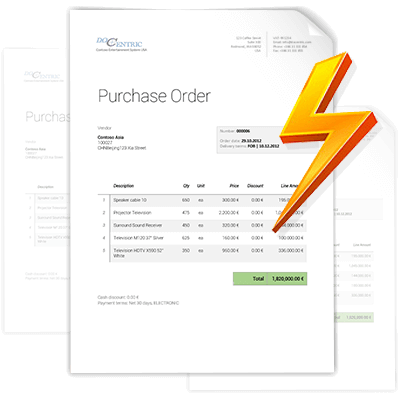 End users can create and update design of reports and documents without help of developers. 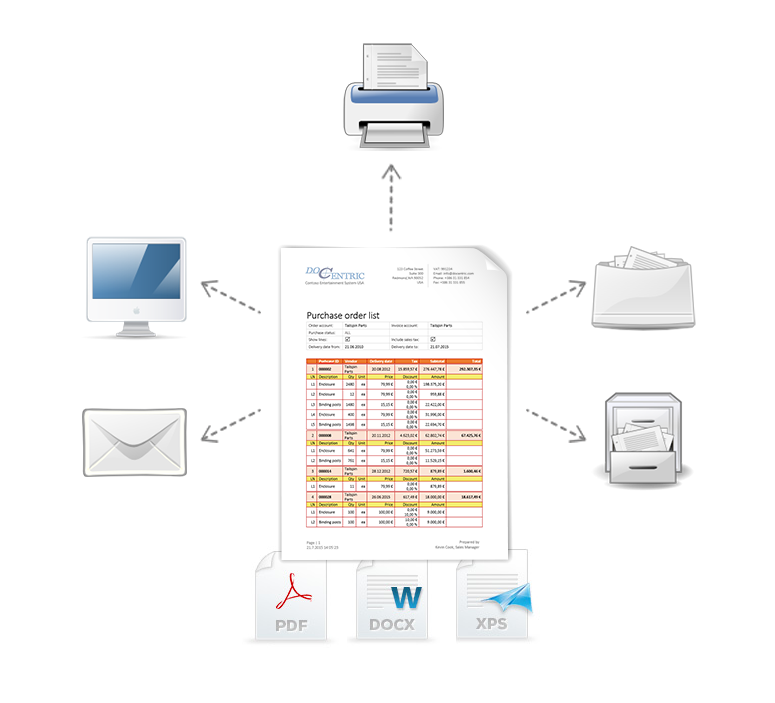 You will be able to communicate report and document requirements with your clients more efficiently. 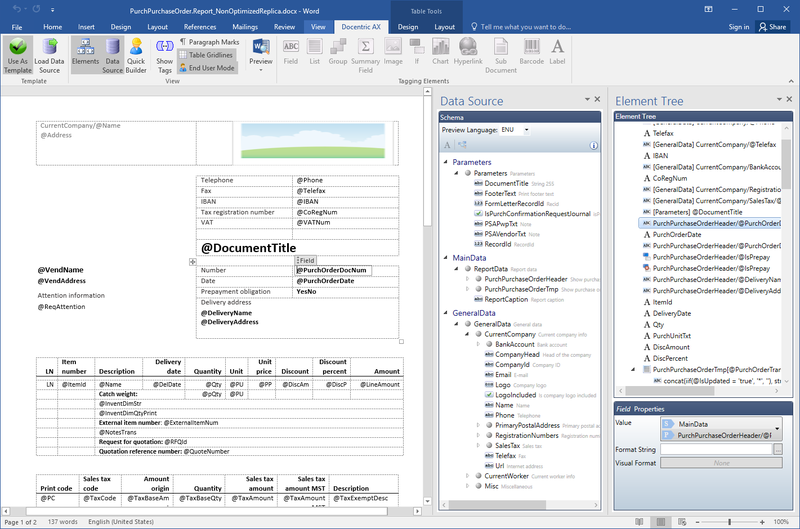 Their input in the form of Word documents can be directly used as a starting point for template design with Docentric AX Designer.